Zen Monster is a literary journal for poetry, fiction, essays, art work, calligraphy and "subversive political commentary" edited by Brian Unger, John High, Lewis Warsh, Robin Ellenbogen, and Andrea Libin --- many of us just happen to practice with Norman Fischer—who is a Contributing Editor. We want to be everything Wind Bell can’t be, a publication that is not ever, in any way, shape or form, under the editorial control of the institution. Our mission statement is glommed directly from the mission statement of the six gallery reading back in san Francisco in 1955: "We commit ourselves to art, fiction and subversive political commentary by buddhist, non-buddhist and trans-buddhist writers, artists and essayists… etc etc. "No inherent limits." We would love to publish some early excerpts of Dave Schneider’s bio of Phil Whalen… We would love to see folks submit well-practiced critical essays, political essays and buddhist essays, letters to the editor, poetry, fiction and art--- and book reviews! We will continue to publish heretofore unavailable Whalen material, McClure work, etc., etc., as well as other writers who inform our tradition and help us connect with the wider world. That is why probably 40 – 50% of the artists and writers who contribute to ZM aren’t even formally buddhists. Many of them just have a cool ‘buddhist’ thing going on in their work. I guess our only caveat is: think wide screen, wide tradition, wide world. Don’t simply imply that buddhism is great because it is buddhism, or a writer or piece of art work is great because the creator is buddhist—that’s potentially incredibly boring. Engage us and our audience as if we have never heard of this particular –ism. Be real. Devotional works are not particularly interesting. Phil Whalen and his mentor William Carlos Williams noticed the most mundane things in simple, close detail. They had an ear for what regular people said, whether silly or wise. Their eyes and ears and minds were, apparently, open to experience. That is a kind of universal application of Zen. 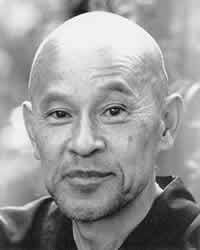 Zen without the centers and the robes and the etc., etc. Free. Untrammelled. The first issue features astounding calligraphy by the late French orientalist Henri Michaux, a number of fascinating and previously unpublished letters and epistolary poems by Philip Whalen, an incredibly concentrated and keen essay on Michaux by Richard Sieburth, anti-war poems by Gloria Frym, Charles Bernstein and Bob Perelman. Plus there are quite fine poems by buddhist and non-buddhist writers both from within and outside the S.F. Zen tradition like Reed Bye, Barbara Henning, Eliot Katz, Fanny Howe, Anne Waldman, Lou Hartman, Norman Fischer and Claudio Bertoni. There is a **MUST READ** essay on Tim Gray’s book on Gary Snyder, by a fellow named Stephen Paul Miller, called "Apocalypse Here." If you are a student of 1960s culture, and the east coast-west coast extended cultural dialectic, this essay will make your week. It is a poem book review, beyond, beyond, way beyond the form of the discursive essay. There is great art work by Max Gimblett, Susan Bee, Michael Wenger and Steven Siegel, among others. Zen Monster feels the need for a thoroughly secular, lay buddhist literary outlet for writers, artists, intellectuals and practitioners. We would like to be a thoughtful, reflective national voice for buddhists absent the commercialism and pandering of the mainstream buddhist press. I hope you guys will pitch into this. It would be unique if we could unite west coast spirituality with east coast intellectuality. Neither side seems to be able to fully incorporate or even accept the other. And yet a truly brilliant American fusion could come out of it. | home | What's New Contact DC [It's a little hard - persevere] | Contests | Digressions | Miscellany | table of contents | Shunryu Suzuki | LibraryofTibetanWorks&Archives | What Was New from 1999 on.